Part 2 of my Etude House Pink Bird Box! 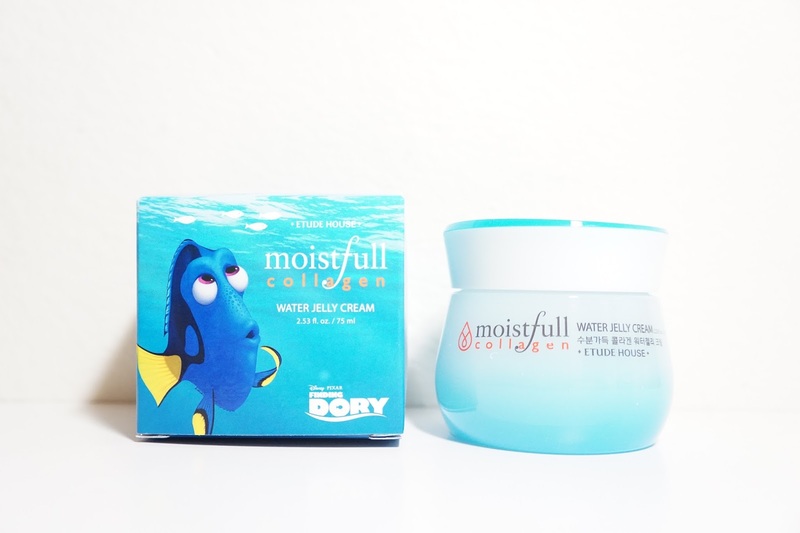 This time, I'll be talking about the Moistfull Collagen Water Jelly Cream* that has special Finding Dory packaging! This cream isn't new, but it was being repromoted with the release of the movie, Finding Dory. It totally makes sense to me though since it is a clear jelly cream like water and is packed with "super collagen cooling water." 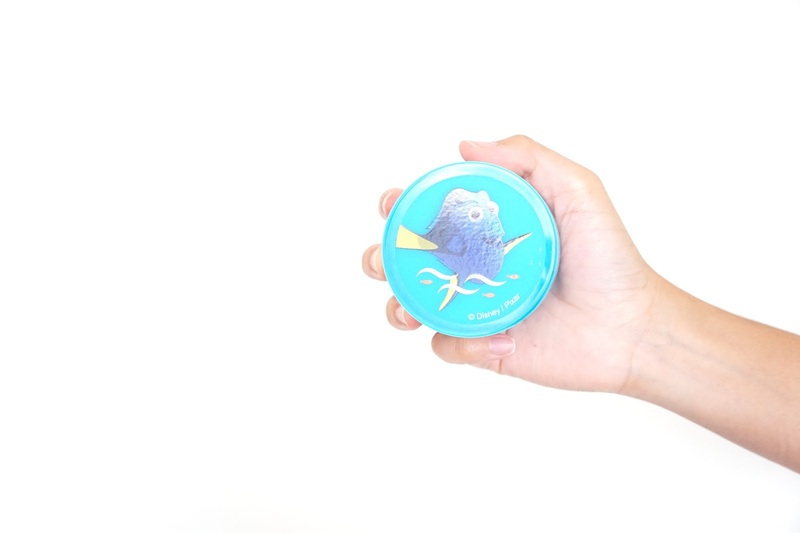 You can find it here on the global Etude House website for $20.40 and it contains 158 grams of product. The packaging is super cute if you're into Dory from Finding Dory / Finding Nemo. There's even a picture of Dory at the bottom of the container so it looks like Dory is swimming in the cream. I've always been cautious of gel moisturizers/creams like this product since they normally make my skin feel sticky and don't moisturize my skin enough. I also think most gel moisturizers are targeted towards people with oily skin since they are more lightweight. The Moistfull Collagen Water Jelly Cream claims to not leave a sticky feeling, but it does unfortunately leave a slightly tacky feeling on my face. I prefer to use an oil on top of this cream at night because of texture reasons, but I tend to use it with only a light essence underneath the cream in the mornings. Surprisingly, this is a pretty good moisturizer and makes my face feel nice and plump but I much prefer using it only in the mornings. I've also been finding that my foundation sticks on longer and I think it's because of the tackiness. It is a bit harder to blend foundations out with a buffing brush, but my base looks great when I apply foundation with a sponge or with a tapping motion. There is a very faint water or clean smell to this cream and is refreshing to me. I'm not super sensitive to fragrance, but I also feel like it's light enough that it won't give anyone any problems. Final thoughts: As a person with dry skin but still gets really sweaty/oily during the summer, I do like this moisturizer. It's light and even a bit cooling, but it's still moisturizing unlike other gel moisturizers and creams I've tried. I am kind of bothered by the tacky texture, but I do make it work because of the other products I would normally layer on top of it anyway. I'm going to happily use this up but I wouldn't rebuy this moisturizer though since there are other lightweight good ones that don't leave a tacky feeling on my face. 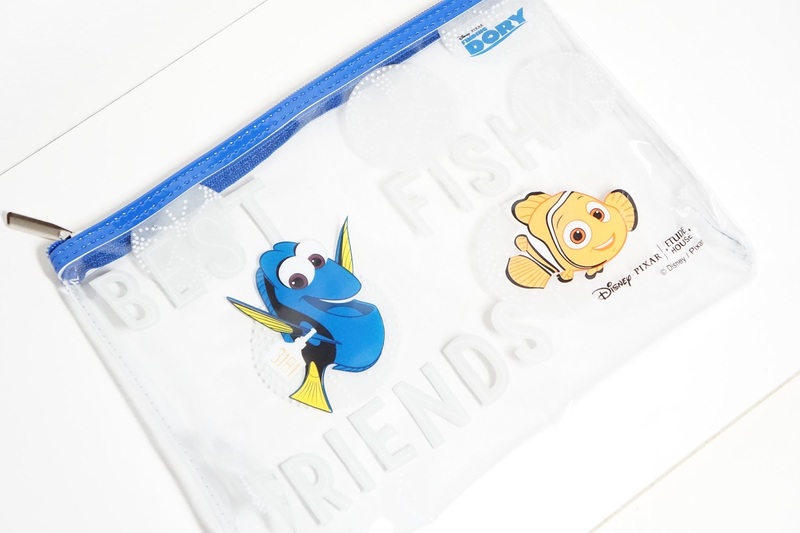 I also got a non-makeup / beauty item and it's this adorable plastic bag! It says "Best Fish Friends" on it. I'm planning on using it for liquid items when I travel since it's super easy to clean.